1.SYDNEY ROAD823Cleveland HouseST 7565 SE 16/57812.6.50. 656/16/578 SYDNEY ROAD 12-JUN-50 CLEVELAND HOUSE GV II* House, formerly The Kennet and Avon Canal offices, built over tunnel of Kennet and Avon Canal. 1817-20. By John Pinch. MATERIALS: limestone ashlar, double pitched hipped slate roof with moulded ridge stacks. PLAN: double depth plan with C20 single storey, flat roofed addition to right. EXTERIOR: 2 storeys to front, 3 storeys to rear, symmetrical 5-window range. Building encircled by blocking course, cornice, frieze, first floor sill band, ground floor platband, and impost band to semicircular recesses to ground floor openings. 3 central bays to front step slightly forward with banded rustication to ground floor. Moulded architraves to first floor 6/9-pane sash windows, central window, with pediment on consoles flanked by windows with cornices and friezes. Semicircular arched ground floor windows have radial glazing bars. Twin entrances at either side of the building: 6-panel doors with circular panels to centre, beneath cobweb fanlights: that to left retains its integral lamp to centre. Rear has 3/3-pane sash windows to second floor, 6/6-pane sashes to first floor, that to centre with cornice and similar ground floor windows to front. Blind windows in architraves similar to those at front to returns. INTERIOR: features include a stone cantilevered staircase with iron rails; a boardroom at first floor level with double-height ceiling rising up to a central dome; barrel-vaulted strong room on ground floor with in-situ safe; large cellar; basement kitchen with dumb waiter rising up to former boardroom, and with refuse shoot running down to canal through hole in the tunnel roof (the legend that this is for passing messages to passing barges is erroneous); extensive survival of joinery and fine plasterwork, and several marble chimney surrounds with reeded surrounds. HISTORY: the Kennet and Avon Canal was opened throughout in 1810. 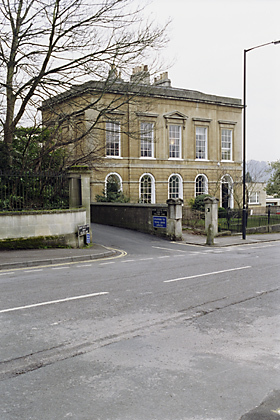 This building was, until 1864, the offices of the Canal company and was originally called Canal House (first recorded use of this name is in 1825). It then passed into residential use until requisitioned for government use in 1939: it housed the Property Services Agency for many years thereafter, and is now offices. This is among the most architecturally refined buildings connected with canals, indicative of the high prestige of the Kennet and Avon enterprise, and is remarkable for its visual, structural and functional relationship with the canal tunnel beneath, as well as for its interior: the arrangement of board rooms, ante-rooms, secure storage areas and twin entrances amounts to a remarkable survival of a purpose-built Georgian office building. The deeds prove Pinch to have been the architect. [John Meadows, 'Bathwick Estate and The Kennet and Avon Canal' in 'Beyond Mr Pulteney's Bridge' (Bath Preservation Trust exhib. Cat. 1987), 17; John Russell, 'The Kennet & Avon Canal' (1997), 97-98; Bath Preservation Trust Inventory of Interiors survey notes, 1991; Robert Bennett, 'The Last of the Georgian Architects of Bath', Bath History IX (2002), 98; Michael Davis, 'Cleveland House' article for 'The Butty', forthcoming (2001)].